The Black Rosebud Set is a stunning pair of hair cutting tools. Made from Japanese 440C Steel for long-lasting performance. This shear combo features Black, Pink, and Purple floral embellishments that decorate the comfortable offset handle and a charming black flower dial. The bottom blade is finished with an elegant flower detail. 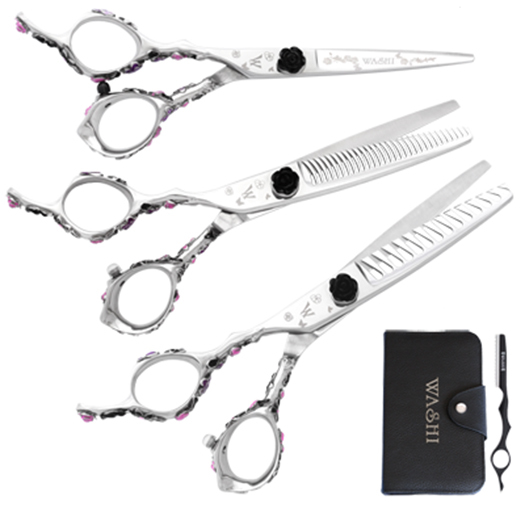 This set includes cutting shear, a 30-tooth Thinner, a 14-tooth Texture Shear, a Texture Razor and a 5-piece case in a color of your choice.